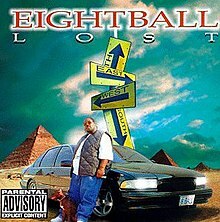 Lost is the debut solo studio album by American rapper Eightball. It is a double album. The album was released on May 19, 1998, by Draper Inc. Records. 8Ball had already released three albums as a part of the group 8Ball & MJG, but after 1995's On Top of the World the group decided to make solo albums before reuniting as a group. This was the second of the group's solo albums, being released after MJG's No More Glory. This album has been certified Platinum by the RIAA for selling 1.8 million copies in the U.S.
^ Stephen Thomas Erlewine (1998-05-19). "Lost - 8Ball | Songs, Reviews, Credits, Awards". AllMusic. Retrieved 2015-06-20. ^ "8Ball Chart History (Billboard 200)". Billboard. Retrieved 2013-09-18. ^ "8Ball Chart History (Top R&B/Hip-Hop Albums)". Billboard. Retrieved September 19, 2013.